Online buying has become one of the best ways for the customers to quench all their shopping needs. According to many experts, people prefer online shopping as it is the most convenient and easy way of purchasing products these days. However, some people are apprehensive about online shopping because of one single drawback—lack of sales representative or sales executive to consult with. Live chat is gaining popularity and is growing at a tremendous rate because of its various benefits. Implementing live online chat software not only boosts conversions and sales but also streamlines the customer support process and reduces operational costs. More and more online shoppers prefer to buy from an ecommerce website offering live chat facility. As a result, many online shopping websites already use this technology aid to provide better service to their customers and probable clients. The customers also like it when someone from the websites provides a “sales executive” like advice to them while they are shopping or looking at the products. Thus, here are 10 mind-blowing facts on why live chat is beneficial for your customer support and business. The first point of contact with any client is very vital for any business. The first initial exchange of words can be very impactful for the customer. Moreover, sadly, you only have one single shot at it. Customers, too, want to assess you in the first look. They want to check out your business and service providing acumen right after they talk to you for the first time. It allows you to interact with your customer, when they need and requires your assistance. The technology helps you to nail that first impression and gives your customers the chance to assess you. One of the best things about this the fact that you are not pestering your customers to talk to you, instead they are coming to you with a simple ‘accept button’. This makes the Live Chat thing even more impressive. Some of the Live Chat apps provide multiple chatting boxes for your executives so that they can tackle the issues and the questions of multiple customers. Acquire provides Live Chat platform that helps your operators to engage in multiple chats simultaneously. It also allows seamless call transfers, call merging, file transfer and executive-to-executive calling. All of it makes quite viable and very important for your company’s customer support system. In addition, if you look at it from the customer’s point of view, Live Chat also allows them to do multitasking. Hence, they do not have to be engaged and spend (read waste) time specifically on customer support only. Customers Love it when they get quick and right attention. You can send an e-mail to your customers and customers can e-mail you back if they have any questions but this is a lengthy process. However, when a customer decides to visit your website, it means he or she is interested in your product. 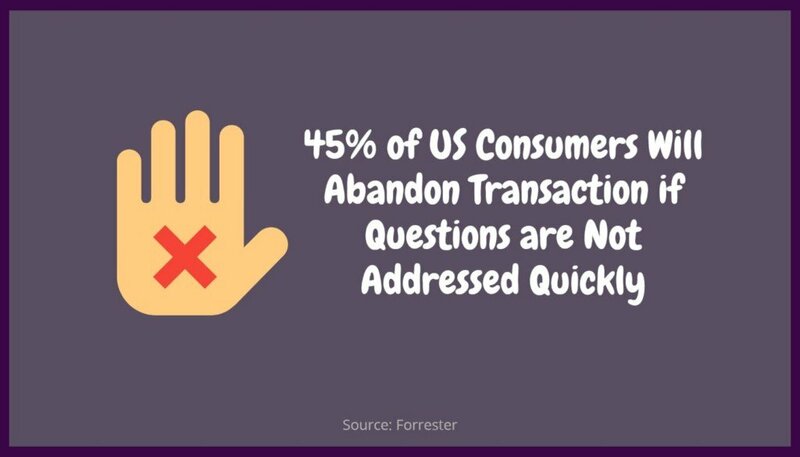 Thus, a quick response is vital to boost conversions. If this were a brick and mortar shop, they would have asked the questions to you directly. Nevertheless, customers can now seek instantaneous clarifications and real-time answers with Live Chat. This means customers do not have to wait for anything when they online shop with you the next time. Save time for the customers. Give them real time answers to complex solutions. Give customers an opportunity to shoot follow-up questions on your answers. This will help the customers to have more confidence in your product. In addition, advice seeking for them would be easier. Real Time chat allows a customer executive to present his or her case about the product or service in a much better way. He or she can easily judge the ‘situation’ and make changes to his or her presentation likewise. It is a win-win for all! On the long run, Live Chat can be fruitful as it can help your customer at the Point of Sale or Purchase. This means, your customers will only buy the thing when they are satisfied with the questions they have, the product itself and with other queries like the styling, warranty, fitting and delivery timings etc. This would mean that less product returns and it will indirectly save your online website the bills. In addition, it will make sure that your customers have the right product in their hands, the one that they need. In addition, customer support through it can also save your telephone bills. This 2012 Aberdeen Group Report suggests that companies can save up 50 % with Live Chat against Telephone Support. As per Telus International, many online companies still do not use Live Chat based Customer Support System. It is not only helpful for serving your existing clients, but it can also help you to procure new ones from the clutches of your rivals. Many companies still do not use Live Chat on their websites, this is where you can take the initiative, and be the first off the blocks. Installing Live Chat would certainly make you wanted and the customers would feel much more inclined because you will have something extra to present. Call it the X-Factor! 70 % of buying experience depends on how the customer is treated Source: McKinsey. Let us face it; a customer is a reason why we all work hard. We want them to have the best experience when they shop with us or consider us. We always try to interact deeply with all our customers so that we create a bond and in turn return to us for the next purchase. Live Chat allows us to have that deeper impact with clients. With Live chat, customers can say their bit and the company has to respond to that quickly. This makes the customer a vital part of the whole transaction and this makes them feel good. It also allows you to create a loyalty and a long-term relationship with the customer, as customers acknowledge that someone instantly answers to them. With E-mails, it is always difficult to derive a definitive data when it comes to customer support. With telephone, the matter is even more complex and vague. However, with Live Chats, you can easily review and check stats and incorporate the knowledge from them later on. You can always see chat histories and you can even sort out the custom site reports. This allows you to pinpoint the mistakes and gives you the data about how many chats were accepted and how many rejected for making better marketing ploys next time around. Customers do not have to install any third party software or plugin if they want to use your website’s live chat option. In some cases, for example with Screen Share tools, your customers have to install an application for a one-on-one with your executives. However, with live chatting, this is not required from the customers' end. Hence, it promotes safety, keeps them safe from malware and encourages them, actually, to use the option for their benefit. When a customer is interested in your product, he or she will want that ‘Live chat’ session with your sales clerk to clarify things and ask the final questions. This is where your people have to present their case in the best possible way so that they can live up to the expectations of the customers. Live Chat allows your people to give your customers the things they need and the points that they want to hear. Even your team get the opportunity to highlight the best things about the product without being too aggressive. Well, competent customer support is all about keeping your clients happy and indirectly giving your sales a bump. In addition, even Live Chat can contribute to that bump, very generously. This study from the American Marketing Association depicts that Live Chat has provided 20 % more conversion and ROI on the tool have been 300 % or more. The numbers do not lie, and on the top of this, we can, also, stress on the fact that customers who use ‘Live Chat’ are more likely to return and use your website again. It is quite clear from the above facts that live chat is the most convenient tool to offer real-time services to customers. Live chat reduces customer churn rate and thus increases conversions and sales. Chatbot Vs. Live Chat: Which Is Winning The Customer Service Game & Why?